Rheumatoid arthritis is one of the most common autoimmune diseases and affects millions of Americans. Standard therapies can relieve symptoms in some patients and provide partial improvement in others. However, some patients may have more refractory disease whereby significant symptoms persist despite treatment. Thus, knowledge of emerging therapies can be helpful to patient outcomes. Treating rheumatoid arthritis, whether by standard therapy or emerging treatments, can be beneficial to both healthcare professionals and their patients. Because rheumatoid arthritis is a potentially debilitating illness that affects work, interpersonal relationships, and overall quality of life, healthcare professionals should be familiar with the common symptoms and diagnostic modalities in order to treat individuals with this disease. This course is designed for physicians, nurses, and allied healthcare professionals involved in the diagnosis, treatment, or care of patients with rheumatoid arthritis. In support of improving patient care, NetCE is jointly accredited by the Accreditation Council for Continuing Medical Education (ACCME), the Accreditation Council for Pharmacy Education (ACPE), and the American Nurses Credentialing Center (ANCC), to provide continuing education for the healthcare team. NetCE is accredited by the International Association for Continuing Education and Training (IACET). NetCE complies with the ANSI/IACET Standard, which is recognized internationally as a standard of excellence in instructional practices. As a result of this accreditation, NetCE is authorized to issue the IACET CEU. This program has been pre-approved by The Commission for Case Manager Certification to provide continuing education credit to CCM® board certified case managers. The course is approved for 5 CE contact hour(s). Activity code: H00031468. Approval Number: 180001145. To claim these CEs, log into your CE Center account at www.ccmcertification.org. This activity was planned by and for the healthcare team, and learners will receive 5 Interprofessional Continuing Education (IPCE) credit(s) for learning and change. NetCE designates this enduring material for a maximum of 5 AMA PRA Category 1 Credit(s)™. Physicians should claim only the credit commensurate with the extent of their participation in the activity. NetCE designates this continuing education activity for 5 ANCC contact hour(s). NetCE designates this continuing education activity for 1 pharmacotherapeutic/pharmacology contact hour(s). NetCE designates this continuing education activity for 6 hours for Alabama nurses. Successful completion of this CME activity, which includes participation in the evaluation component, enables the participant to earn up to 5 MOC points in the American Board of Internal Medicine's (ABIM) Maintenance of Certification (MOC) program. Participants will earn MOC points equivalent to the amount of CME credits claimed for the activity. It is the CME activity provider's responsibility to submit participant completion information to ACCME for the purpose of granting ABIM MOC credit. Completion of this course constitutes permission to share the completion data with ACCME. Successful completion of this CME activity, which includes participation in the activity with individual assessments of the participant and feedback to the participant, enables the participant to earn 5 MOC points in the American Board of Pediatrics' (ABP) Maintenance of Certification (MOC) program. It is the CME activity provider's responsibility to submit participant completion information to ACCME for the purpose of granting ABP MOC credit. AACN Synergy CERP Category A. NetCE is authorized by IACET to offer 0.5 CEU(s) for this program. Rheumatoid arthritis ranks among the chronic diseases with the greatest effect on health-related quality of life and the most substantial socioeconomic impact, and the intermittent nature of the disease can make diagnosis and treatment difficult. The purpose of this course is to educate healthcare professionals about the epidemiology, diagnosis, and treatment of rheumatoid arthritis in order to ensure early diagnosis and improvement in patients' quality of life. Describe the epidemiology, demographics, and costs related to rheumatoid arthritis (RA). Analyze the pathophysiology and etiology of RA. Identify the associated signs and symptoms of RA, including laboratory findings and implications for differential diagnosis. State the current recommendations for classification of RA according to the American College of Rheumatology (ACR) guidelines. List the benefits and risks associated with pharmacologic RA treatments. Describe the role of surgery and physiotherapy in the treatment for RA. Analyze the role of complementary/alternative therapies in the management of RA. Recognize extra-articular manifestations of RA. Outline the management strategies for patients with RA, including non-English-proficient patients. Lloyd Zimmerman, MD, MPH, received his MD from Ross University School of Medicine and his MPH from New York Medical College. He has written extensively on a variety of critical healthcare topics, such as cardiovascular medicine, gastroenterology, neurology, urology and obstetrics/gynecology. Currently, Dr. Zimmerman is an active member of Science Writers in New York (SWINY), the American Medical Writer Association (AMWA), and the American College of Health Care Executives (ACHE). Contributing faculty, Lloyd Zimmerman, MD, MPH, has disclosed no relevant financial relationship with any product manufacturer or service provider mentioned. Rheumatoid arthritis (RA) is a systemic disease that leads to inflammation of the joints and surrounding tissues. It can also affect other organs such as the eyes, heart, and lungs. RA can occur at any age, but onset before the age of 35 years in men is uncommon . Even less frequently, RA can develop in childhood. Juvenile RA is characterized by an onset before 16 years of age and is among the most significant chronic diseases of childhood. People who develop RA at younger ages more often develop a severe form of the disease. However, for the purpose of this course, the main focus will be on RA that develops in adulthood. An estimated 1.5 million American adults are affected by RA . The yearly incidence of RA is approximately 53 per 100,000 for women and about half that (27.7 per 100,000) for men . These figures vary significantly based on the age of the cohort. The data show that the incidence of RA increases steadily with age in both sexes, until approximately 65 to 74 years of age, when incidence peaks . However, women in all age groups have a much higher incidence compared with men. In most cases, updated statistics and costs related to RA are included as part of the larger category of related arthritic or rheumatic conditions. There were 18.9 million office visits for primary rheumatic conditions in 2013, totaling approximately 2.1% of all ambulatory care visits that year (2.1% for women, 2.0% for men) . An estimated 23% (52.5 million) of adults in the United States reported having doctor-diagnosed arthritis between 2010 and 2012, and 50% of adults 65 years of age or older reported an arthritis diagnosis (i.e., some form of arthritis, RA, gout, lupus, or fibromyalgia) . By 2030, an estimated 67 million Americans 18 years of age or older are projected to have diagnosed arthritis . Overall, RA and related arthritic diseases have a significant impact in the United States, causing disability and premature mortality. Although many people with RA work full-time, about 10% of those with RA become severely disabled and unable to do simple daily living tasks. Many report significant limitations in vital activities such as walking, stooping/bending/kneeling, climbing stairs, and social activities . RA can shorten a patient's life expectancy by an average of three to seven years. However, individuals with severe forms of RA may die 10 to 15 years earlier than expected . It has been found that people with RA are 2.3 times as likely to die as other people of the same age . There are significant costs associated with RA, and these arthritic-related disease costs continue to increase. In 2003 (the most recently available data), the total cost attributed to arthritis and other rheumatic conditions in the United States was $128 billion, up from $86.2 billion in 1997 . Medical expenditures (direct costs) for arthritis and other rheumatic conditions in 2003 were $80.8 billion, up from $51.1 billion in 1997 . Earnings losses (indirect costs) for arthritis and other rheumatic conditions in 2003 were $47 billion, up from $35.1 billion in 1997 . Individuals with RA are far more likely to change occupation, reduce work hours, lose their job, retire early, and be unable to find a job compared with people without arthritis . Research shows that the risk of developing RA is nearly double for current smokers compared with nonsmokers . RA is strongly associated with major depression (attributable risk of 18.1%), probably through its role in creating functional limitation . As discussed, most mortality studies in patients with RA have found increased mortality rates as compared with the general population, with studies showing one-third to one-half of the premature deaths in patients with RA are due to cardiovascular conditions such as ischemic heart disease and cerebrovascular accidents [4,8]. It is unclear whether cardiovascular disease results from RA or if it precedes the onset . As noted, RA is defined as a chronic inflammatory disease characterized by uncontrolled proliferation of synovial tissue and a wide array of multisystem comorbidities . 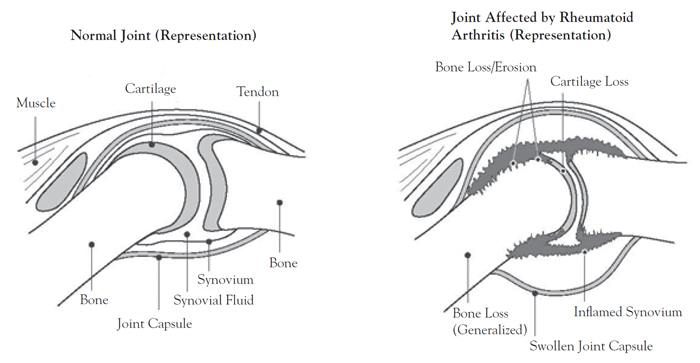 In its most common presentation, RA affects the joints, causing inflammation of the synovium and cartilage and bone loss (Figure 1). The precise etiology of RA is presently unknown. Most likely it has an autoimmune origin (whereby an individual's immune system confuses healthy synovial tissue for foreign substances, thereby attacking the synovial joint surfaces) given that autoantibodies (e.g., rheumatoid factor, anti-citrullinated protein antibody [ACPA]) are present and often precede the clinical manifestation of RA by many years [6; 10; 11]. The course and severity of the illness can vary considerably, and infection, genetic factors, and hormones may contribute to the disease. RA appears to require the complex interaction of genetic and environmental factors with the immune system and ultimately in the synovial tissues throughout the body. Triggers for RA have long been the target of active research. Purported triggers have included bacteria (Mycobacterium, Streptococcus, Mycoplasma, Escherichia coli, Helicobacter pylori), viruses (rubella, Epstein-Barr virus, parvovirus), and superantigens [6,12]. Although RA has a clear genetic component, only about 1 in 25 white individuals with the so-called shared epitope develop RA . Even if one monozygotic twin has RA, there is only approximately a one in six chance that the other twin will develop the same disease. Thus, other factors in addition to genetics are active as precipitators or triggers of RA . The history and physical examination are the most sensitive and specific tools for RA diagnosis. Findings on general physical examination are normal except for an occasional low-grade fever (38°C) and a slightly elevated pulse rate. The characteristic patient with RA initially presents with complaints of pain and stiffness in multiple joints. There is prominent and prolonged morning stiffness (lasting more than one hour) that usually begins gradually with fatigue, loss of appetite, widespread muscle aches, and weakness [4,6,12]. After this initial presentation, joint pain appears. When the joint is not used for some time, it can become warm, tender, and stiff. After inflammation of the joint, increased synovial fluid is produced and the joint becomes swollen. There is accompanying soft tissue swelling, and joint pain is often felt bilaterally, affecting the fingers, wrists, elbows, shoulders, hips, knees, ankles, toes, and neck . Though the joints are tender, the small joints of the hands and feet are not usually painful when the patient is at rest. Palmar erythema and prominent veins on the dorsum of the hand and wrist indicate increased blood flow. Distal interphalangeal joints are rarely involved. The temperature over the involved joints (except the hip) can be elevated, but there is usually no accompanying erythema. There are limitations in the range of motion, muscle strength, and function around inflamed joints. In addition, soft, poorly delineated subcutaneous nodules (rheumatoid nodules) are often found in the extensor surface of the forearm. Soft, small lymph nodes are found occasionally in epitrochlear, axillary, and cervical areas . Other symptoms that may present include anemia due to deficits in bone marrow production; eye burning, itching, and discharge; or lung inflammation (pleurisy) [4,6,9,12]. Joint destruction may occur within one to two years after the appearance of the disease. The 2010 American College of Rheumatology (ACR) and European League Against Rheumatism (EULAR) joint working group recommends several laboratory tests for the diagnosis of RA, including rheumatoid factor (RF), erythrocyte sedimentation rate (ESR), C-reactive protein (CRP), and anti-cyclic citrullinated peptide (anti-CCP) antibody . A positive rheumatoid factor is the most specific and sensitive laboratory marker of RA, as it is seen in about 70% to 80% of patients [4,9,12]. It is also present in many healthy individuals, patients with other rheumatic diseases, and individuals with chronic infections . ESR is typically ≥30 mm/hour, and CRP level is typically ≥0.7 pg/mL. Both levels are associated with disease activity, and the CRP value over time correlates with radiographic progression [9,13,14]. The anti-CCP antibody test is a specific blood test available for diagnosing RA and distinguishing it from other types of arthritis [9,12]. The anti-CCP antibody test is a marker of ACPA and is positive in about 80% to 90% of patients; it can also be present in other diseases, including active tuberculosis, and is especially useful in early synovitis. While RA differs from person to person, individuals with rheumatoid factor, the anti-CCP antibody, or subcutaneous nodules tend to have more severe forms of the disease [9,12]. As noted, RA is a clinical diagnosis . To date, biomarkers for the initial tissue processes that cause joint damage in RA lack prognostic accuracy and are therefore inadequate as stand-alone tests, but they can help to rule out other causes of arthritis when a patient has clinical features of RA . In 2010, a multi-biomarker disease activity test, Vectra DA, was introduced. This test uses a unique algorithm to derive a composite score (1 to 100) based on the results of 12 blood protein biomarkers, including vascular cell adhesion molecule-1, epidermal growth factor, vascular endothelial growth factor A, interleukin-6 (IL-6), tumor necrosis factor (TNF) receptor type 1, matrix metalloproteinase-1 or collagenase-1, matrix metalloproteinase-3 or stromelysin-1, YKL-40, leptin, resistin, serum amyloid, and CRP [17,18]. Vectra DA has been independently verified and found to correlate well to disease activity measured with RA assessment tools (e.g., Disease Activity Score in 28 joints using the CRP level). The test is validated for use in adults already diagnosed with RA but is not intended to diagnose RA . There are several other laboratory tests used in the differential diagnosis of RA. Urinalysis may reveal mild normochromic and either normocytic or microcytic anemia (hemoglobin 10 g/dL); white blood cell count and differential may reveal thrombocytosis [9,14]. Although baseline evaluation of renal and hepatic function is not sensitive or specific for RA, it is recommended because the findings will guide medication choices. In certain instances, clinicians may perform an arthrocentesis in order to differentiate RA from other arthropathies . Usual findings from synovial fluid aspiration that support a diagnosis of RA include straw-colored fluid with a significant number of fibrin flecks, synovial fluid ability to clot at room temperature, and 5,000–25,000 white blood cells (WBCs)/mm3 (5 to 25 × 109/L) with 85% polymorphonuclear leukocytes (PML) [4,9]. In addition, bacterial cultures are negative, no crystals are present, and the synovial fluid glucose level is low [4,9]. For patients with chronic extremity joint pain and suspected rheumatoid arthritis, the American College of Radiology recommends x-ray as the imaging study of choice for evaluation. Popular imaging tests for RA include joint ultrasound, magnetic resonance imaging (MRI), and joint x-rays. Imaging studies may show normal findings or osteopenia and erosions near joint spaces in early disease; wrist and ankle films are useful as baselines for comparison with future studies [9,21]. Implementing the modern treatment strategy in RA (i.e., early initiation and optimal adjustments of aggressive therapies) requires methods for early diagnosis and sensitive monitoring of the disease process. In RA clinical trials and routine management, conventional radiography is the pivotal method for diagnosing and monitoring structural joint damage. It is inexpensive, readily available, easily reproducible, and allows easy serial comparison for assessment of disease progression . However, it is insensitive to bone damage at its earliest stages and incapable of capturing synovitis. In comparison with radiography, MRI offers assessment of bone damage with improved sensitivities to early pathology and changes in joint structure . With increased use of MRI, it has been found that joints occasionally exhibit MRI evidence of synovitis in the absence of symptoms . In addition, detailed assessment of soft tissue changes, including synovitis and tenosynovitis, is possible, and MRI findings are of prognostic value for the long-term radiologic outcome. Ultrasonography, although less specific and sensitive in RA diagnosis than MRI, offers comparable information on both inflammatory and destructive changes in RA finger and toe joints. MRI and ultrasonography have significantly increased detection of early joint damage, assessment of synovial inflammation, and therapeutic management of patients with RA. Clinicians should be familiar with the MRI and sonographic appearances of early RA in the small synovial joints of the appendicular skeleton. Sonography provides a way to detect synovitis, whereas MRI allows a more intricate approach to the small synovial joints of the appendicular skeleton. Because the available recommended laboratory tests are insufficient for early detection of RA and diagnosis of rapidly advancing disease, research focusing on identifying biomarkers that improve diagnostic and prognostic accuracy is ongoing. A 2013 study found that serum cartilage oligomeric matrix protein (COMP) levels can predict how rapidly RA will progress . (COMP levels are typically elevated early in the disease process and then stabilize or wane as the disease advances in patients with typical RA.) Patients whose serum-COMP levels steadily increased between their diagnosis and the subsequent three months had significantly more joint damage at one-, two-, and five-year follow-ups than patients with steady or reduced serum-COMP levels . A separate study also found that high serum COMP levels in early stage RA were associated with bone erosion, whereas low serum-COMP levels in early stage RA were not . Calprotectin levels were also found to correlate with clinical and laboratory assessments of joint inflammation in a small-scale 2013 study . Levels of the protein decreased in response to treatment, indicating calprotectin is a promising biomarker for assessment and monitoring of RA disease activity. Further research is needed to examine whether calprotectin sampling is a useful tool. Four novel biomarkers (UH-RA.1, UH-RA.9, UH-RA.14, UH-RA.21) were investigated in a study that included 292 patients with RA, 97 healthy controls, and 87 rheumatic control patients who had tested negative for RA with conventional detection methods [24,25,26]. Antibody reactivity to two peptides (UH-RA.1 and UH-RA.21) was also evaluated in 600 patients with RA, 309 patients with undifferentiated arthritis, and 157 rheumatic controls. In both cohorts, 38% of patients with RA were seronegative for RF and ACPA. Testing for autoantibodies to the two peptides reduced the serologic gap in both cohorts . Connective tissue diseases Consider biomarkers for scleroderma and systemic lupus erythematosus. Fibromyalgia Evaluate for trigger points that cause pain symptoms. Hemochromatosis Perform iron studies and assess skin coloration changes. Infectious endocarditis Rule out heart murmurs, high fever, and history of intravenous drug use in history and physical examination. Lyme arthritis Patient resides in or has traveled to Lyme-endemic area, has a history of erythema migrans or other disease manifestations, and involvement is restricted to large joints. Serologic testing is positive for Lyme disease. Polyarticular gout Diagnose erythematous joints (podagra commonly found). While gout and rheumatoid arthritis rarely coexist, calcium pyrophosphate deposition disease can accompany rheumatoid arthritis. Polymyalgia rheumatica Presents with only pain in the proximal joints of the extremities, unlike rheumatoid arthritis. Sarcoidosis Hypercalcemia on lab findings, and granulomas likely on chest films. Seronegative spondyloarthropathies, reactive arthritis Tend to be more asymmetric than rheumatoid arthritis. More commonly involves the joints of the spine. Evaluate for history of psoriasis, Reiter comorbidities, and inflammatory bowel disease. Reactive arthritis can be postinfective, sexually acquired, or related to gastrointestinal disorders. Still disease Tends to present with fever, leukocytosis with left shift, sore throat, splenomegaly, liver dysfunction, and/or rash. Thyroid disease Consider thyroid-stimulating hormone level, depending on symptoms. Viral arthritis Parvovirus, hepatitis B, rubella, and Epstein-Barr are among the differential viruses considered. Early in the course of RA, self-limited viral syndromes should be considered, especially hepatitis B and C, parvovirus, rubella (infection or vaccination), and Epstein-Barr virus [27,28,29]. At any time, systemic lupus erythematosus, psoriatic arthritis, and reactive arthritis may present diagnostic challenges. This requires a targeted history and examination to elucidate associated clinical symptoms, such as rashes, oral ulcers, nail changes, dactylitis, urethritis, and renal, pulmonary, gastrointestinal, or ophthalmologic complications [4,27]. Remitting rheumatoid factor-negative symmetrical synovitis with pitting edema and paraneoplastic syndromes should be considered in elderly patients with fulminant-onset RA . Chronic tophaceous gout may also mimic severe nodular RA. Hypothyroidism not only causes many rheumatic manifestations but also occurs commonly in conjunction with RA and, therefore, should be kept in mind . In 2010, the ACR/EULAR published their Classification Criteria for Rheumatoid Arthritis (Table 2) . These criteria are the standard for the classification of RA, replacing the 1987 ACR criteria. The new measures have much greater statistical power to identify early disease and distinguish the efficacy of treatments than the 1987 response measures. a Target population: patients who have at least 1 joint with definite clinical synovitis in whom the synovitis is not better explained by another disease. b Large joints include shoulders, elbows, hips, knees, and ankles. c Small joints refers to the metacarpophalangeal joints, proximal interphalangeal joints, second through fifth metatarsophalangeal joints, thumb interphalangeal joints, and wrists. RF = rheumatoid factor; ACPA = anticitrullinated protein antibody; CRP = C-reactive protein; ESR = erythrocyte sedimentation rate. These classification scales have been updated with proposals for revision from the ACR . According to the Medical Services Commission of British Columbia, the objective of RA treatment is to suppress all inflammation and prevent joint damage. Most patients will require long-term DMARD therapy. RA has no known prevention or cure. Lifelong treatment is usually required, including medication, physical therapy, exercise, and possibly surgery. In order to provide the best outcomes, patients should be educated regarding the most appropriate treatment regimens for their disease manifestations, as earlier RA diagnosis can assist in aggressive early treatment for RA (when indicated), thereby delaying joint destruction. The 2010 ACR/EULAR Classification Criteria for Rheumatoid Arthritis is now a well-established diagnostic and prognostic tool; as such, guidelines (e.g., the 2016 update of the EULAR Recommendations for the Management of Rheumatoid Arthritis with Synthetic and Biological Disease-Modifying Antirheumatic Drugs) recommend that patients start treatment with a disease-modifying antirheumatic drug (DMARD) immediately following a RA diagnosis . Therapeutic goals include preservation of function and quality of life, minimization of pain and inflammation, joint protection, and control of systemic complications, with the ultimate aim being low disease activity or remission [4,9,12,32,33]. Until the 1980s, pharmacologic treatment of RA used a so-called "pyramid" approach . Symptom-alleviating treatment was started at diagnosis; as symptoms progressed, dosages were changed or additional medications were added . Standard pharmacotherapy involved a nonsteroidal anti-inflammatory drug (NSAID) for control of pain, and if not effective, initiation of a DMARD later. Throughout the next few decades, treatment involved the initiation of a DMARD, particularly methotrexate, after diagnosis, but still focused on alleviating symptoms with NSAIDs and low-dose oral or intra-articular glucocorticoids . Today, the recommended standard of treatment is a tightly controlled, aggressive strategy tailored to each patient, with modifications to the individual medication regimen to achieve a particular target (remission, or alternatively, low disease activity) in a specific period of time (usually six months) [32,35]. The "treat-to-target" approach for a patient with early high disease activity and poor prognostic features typically involves initiation of methotrexate and/or another DMARD(s) immediately upon diagnosis [32,33,35]. Initial combination therapies with DMARDs, particularly those including a biologic anti-TNF agent, appear to provide earlier clinical improvement and less joint damage progression in patients with early moderate or highly active disease; they can be withdrawn successfully, and fewer treatment adjustments are needed than with initial monotherapies [32,35,36,37,38]. Patients with active disease are monitored closely (every one to three months), and it is recommended that treatment adjustments be made if there is no improvement at three months (or if the six-month target has not been reached) [32,35]. Patients with low-to-moderate disease activity or high disease activity without poor prognostic features are typically started on DMARD monotherapy. A 2012 meta-analysis of four studies comparing tight control with usual care found that applying a treat-to-(any)target approach approximately doubled remission rates in patients with early RA with high disease activity . One small-scale study comparing early aggressive treatment (i.e., methotrexate) with usual care (i.e., using milder drugs initially, with intensification of treatment as needed) found that there was approximately 50% remission in each group at the study end point (two years) . However, during the course of the study, 23 of 24 patients in the conventional care group had progressed to aggressive treatment (with methotrexate) and most were given intra-articular corticosteroids much more frequently than those in the tight control group. It is interesting to note that the aggressive treatment group, which was started on methotrexate, was not aggressive by today's standards, as adalimumab was only started in poor responders six months after initiation of treatment. Progression of joint damage (i.e., lack of radiologic remission) occurred among a minority of participants even in the aggressive treatment group who were considered to be in clinical remission (based on assessment scores); on average, radiologic and functional scores were similar in both groups at the end of the study . The authors emphasize that their results do not indicate an advantage of one treatment strategy over another; instead factors such as patient preference and risk versus benefit (e.g., weighing the severe side effects of the stronger DMARDs against their rapid response) should guide the treatment decision . In addition, the measures of remission are ill defined, and to progress a patient from low disease activity (which may be a satisfactory target) to clinically defined remission may require a medication regimen greater than what is safe or tolerable. Most clinicians in the study were unwilling to push for remission if their patient's disease was reduced to an acceptable level with conservative treatment. DMARDs are the current standard of pharmaceutical care for RA, and their choice for a patient should be determined by several factors, including patient compliance, disease severity, physician experience, and the presence of various comorbidities. Table 3 provides a list of the most commonly used DMARDs and their most common adverse effects [35,36,37,38]. Methotrexate is the most commonly prescribed DMARD and is still considered the "anchor drug" for the treatment of RA [32,35,41]. Leflunomide, a competitive inhibitor of an intracellular enzyme needed for de novo pyrimidine synthesis, is a newer DMARD with comparable efficacy that can be substituted for methotrexate and may be particularly useful for patients with intolerance of or contraindications to methotrexate [9,32,42,43]. Patients who have failed monotherapy with methotrexate may benefit from the addition of leflunomide, either with methotrexate or other DMARDs [32,35,43]. Other commonly prescribed DMARD medications include hydroxychloroquine, minocycline, and sulfasalazine; the anti-TNF biologic agents adalimumab, etanercept, infliximab, certolizumab pegol, and golimumab; and the non-TNF biologic agents abatacept, anakinra, rituximab, and tocilizumab . Sulfasalazine and hydroxychloroquine are anti-malarial medications that are often prescribed as first-line therapy. However, the treatment effects of the anti-malarial medications may take weeks or months in order to be effective [38,44]. In more severe cases (i.e., moderate or high disease activity and poor prognostic features), combination therapy with two or three DMARDs is used as immediate first-line treatment [32,35,38,44]. Biologic agents (anti-TNF and non-TNF) have been used since 1998 and are now a well-established form of DMARD therapy . Non-TNF agents are generally only used if TNF-alpha inhibitors fail to control disease or if they are contraindicated [32,35]. The TNF-alpha inhibitors (adalimumab, etanercept, infliximab, certolizumab pegol, and golimumab) block the proteins responsible for the inflammation process and are given subcutaneously or intravenously, thereby lowering TNF-alpha levels, which are elevated in the synovial fluid in patients with RA [4,9,12,35]. Treatment with anti-TNF therapies also significantly improves the anemia associated with RA [38,45,46]. Etanercept is a soluble TNF-alpha-receptor fusion protein, with some studies showing comparable long-term treatment effects to methotrexate [9,47]. However, etanercept elicits more rapid symptom improvement, often within two weeks . Infliximab is another anti-TNF-alpha antibody that has shown greater response than placebo (52% versus 17%) in patients who had a poor response to methotrexate [48,49]. Adalimumab, a recombinant TNF-alpha antibody, has an additive effect when taken with methotrexate . Certolizumab pegol is a humanized antigen-binding fragment (Fab') of a monoclonal antibody that has been conjugated to polyethylene glycol and is administered subcutaneously . It is the only anti-TNF pegylated Fab' approved for use in RA, either as monotherapy or with other DMARDs. Because of certolizumab pegol's unique structure, certain cytotoxic effects (e.g., complement-dependent cytotoxicity, antibody-dependent cell-mediated cytotoxicity) seen with other anti-TNF agents (adalimumab, infliximab, and etanercept) do not occur . Certolizumab pegol also does not actively transfer across the placenta; although it has been used safely during pregnancy in humans (and in animal studies), this agent should only be used if clearly needed. Golimumab is an anti-TNF-alpha antibody similar to adalimumab and infliximab . One study found that golimumab had a similar safety profile as the other anti-TNF agents, but that the 100-mg dose showed higher incidences of serious infections, demyelinating events, and lymphoma than 50 mg . A follow-up to this study reported safety of golimumab through year five, which was consistent with previously reported findings at the third year, but with similarly higher incidences of tuberculosis, lymphoma, opportunistic infections, and demyelination . The non-TNF agents (abatacept, anakinra, rituximab, and tocilizumab) are specific white blood cell modulators that work to control inflammation. Abatacept decreases the number of T-cells, which reduces the activation of other cells in the inflammatory process. Abatacept is given once a month either subcutaneously or intravenously [4,9,12]. Anakinra is a recombinant interleukin-1 (IL-1) receptor antagonist that has been found to be more effective than placebo when administered alone or in combination with methotrexate in several randomized controlled trials [38,45]. Anakinra, anti-TNF therapies, and denosumab (a nuclear factor-kappa B [RANK] ligand inhibitor) have the demonstrated ability to improve RA-associated osteoporosis and joint space erosions [38; 45]. Overall, indirect comparisons between anakinra and most other biologic DMARDs reveal that anakinra is associated with a significantly lower risk of adverse events; however, it is associated with skin irritation at the injection site, increased infection risk, and leukopenia [38; 54]. Rituximab is a B-cell surface receptor antibody that has shown promise in several studies. It is given intravenously twice a year and reduces the number of abnormal B-cells produced in patients with RA . Response rates and time to relapse vary significantly among individuals treated with rituximab. One study evaluated these variables among 17 patients with RA . Eight patients were seropositive for RF; nine were seronegative for RF. Both groups were treated with two cycles of rituximab, and all patients were re-evaluated following treatment. Rituximab was re-administered when disease relapse was confirmed by clinical laboratory measures. CD20+ cells and CD2- receptor expression levels were estimated at initiation, relapse, and re-evaluation time points and compared between the two groups. Compared with the seronegative group, patients with seropositive disease responded more favorably to treatment with rituximab and demonstrated a longer time to relapse . According to the National Institute for Health and Care Excellence, tocilizumab, in combination with methotrexate, is recommended as an option for the treatment of rheumatoid arthritis in adults if the disease has responded inadequately to DMARDs and a TNF inhibitor and the person cannot receive rituximab. Tocilizumab blocks the attachment site for IL-6, effectively preventing the cytokine from activating an immune response . The agent is administered as a monthly IV infusion. Adjusting the dose frequency of tocilizumab may be a useful strategy . Tocilizumab appears to have a similar safety profile as other non-TNF biologic agents. Rheumatoid neutrophilic dermatitis has been reported in a patient taking tocilizumab for RA treatment . Tocilizumab should be combined with a DMARD [32,35,60]. Regarding signs and symptoms, physical function, and joint damage, there is some evidence to support the efficacy of tocilizumab monotherapy [32,35,60].In 2012, a targeted agent, tofacitinib, was approved by the U.S. Food and Drug Administration (FDA) for the treatment of patients with RA with inadequate response to methotrexate . Tofacitinib is an oral Janus kinase inhibitor and is the first in the class to be approved for the treatment of RA. The approved dose is 5 mg twice daily, but this may be decreased to one 5-mg dose daily in the presence of moderate-to-severe renal impairment, moderate hepatic impairment, or coadministration of certain antifungals . Tofacitinib can be used either as monotherapy or in combination with methotrexate or other nonbiologic DMARDs . Boxed warnings related to risks for serious infection, tuberculosis, and lymphoma and other malignancies have been issued for this agent. Unfortunately, many of the available RA treatments can also cause serious side effects . Because biologics have significant side effects and are expensive, patients with mild or moderate disease are often first treated with methotrexate (unless contraindicated) or other conventional DMARDs . Induction of malignancy is a concern when RA is treated with biologic therapy, as patient immune systems are suppressed; however, a 2014 systematic safety literature review found that the overall risk for malignancy is not significantly increased, with the exception of melanoma (adjusted hazard ratio: 1.5) [4,9,12,62,63,64]. A follow-up review conducted in 2016 confirmed these findings . Biologics are associated with an increased risk of infection, especially tuberculosis and herpes zoster reactivation [38,50,64,65]. Patients should be evaluated for latent tuberculosis infection before drug administration and monitored for signs and symptoms of active tuberculosis [4,9,12,35]. Patients at risk of hepatitis B virus infection should be evaluated for carrier status before adalimumab initiation; any live vaccine should not be concurrently administered in these patients . Vaccination with live attenuated vaccines (e.g., herpes zoster) should be undertaken prior to initiation of TNF and non-TNF biologics . NSAIDs, glucocorticoids, or cyclooxygenase-2 (COX-2) inhibitors are often used concurrently to treat RA-associated joint pain and inflammation. However, they do not alter the disease course and should not be used as single therapy. Potential side effects are a consideration with these medications as well. Patients taking NSAIDs should be monitored for long-term NSAID-associated complications such as gastrointestinal bleeding, cardiovascular problems (e.g., myocardial infarction, stroke), and gastric ulcers and bleeding. COX-2 inhibitors block an inflammation-promoting enzyme called cyclooxygenase; this drug class was initially believed to work as well as traditional NSAIDs, but with fewer stomach problems. However, myocardial infarction and stroke reports have prompted the FDA to re-evaluate the risks and benefits of the COX-2 inhibitors. Although certain COX-2 inhibitors (such as celecoxib) are still available, they are labeled with strong warnings and a recommendation for prescribing the lowest possible dose for the shortest possible duration . Corticosteroids reduce joint swelling and inflammation, and a glucocorticoid injection is a safe and highly effective, but temporary, intervention for single-joint treatment. Infectious arthritis should be ruled out before injections are performed. Steroid dosages equivalent to less than 10 mg of prednisone daily are highly effective for relieving RA symptoms and can slow joint damage . Corticosteroids should be considered when initiating or changing conventional DMARDs, in different dose regimens and routes of administration, but should be tapered as rapidly as clinically feasible due to potential long-term side effects, including osteoporosis, cataracts, Cushingoid symptoms, and blood glucose level abnormalities . The ACR recommends that patients being treated with glucocorticoids take 1,200–1,500 mg of calcium and 800–1,000 IU of vitamin D daily to prevent glucocorticoid-induced osteoporosis . Symptoms may recur with steroid discontinuation, especially when high dosages are used. Therefore, the agents should be withdrawn slowly, over one month or more, to avoid rebound effects . Systemic steroids often are used as "bridging therapy" during the initiation of DMARDs therapy before their action is noted; some of the newer DMARDs have a relatively rapid onset of action, making this method less necessary . Occasionally, surgery is needed to correct severely affected joints. Surgeries serve to relieve joint pain, correct deformities, and modestly improve joint function [4,9,12]. The most successful locations of surgery are those performed on the knees and hips [4,9,12]. The first surgical treatment performed is a synovectomy, which removes part or all of the joint lining (synovium). This procedure may only provide temporary relief, but it can be effective for patients for whom pharmacologic treatment has not resulted in improvements. Surgeries performed in later-onset disease include total joint replacement with a joint prosthesis. In extreme cases, total knee or hip replacement can have enhanced importance, making the difference between a dependent or independent lifestyle for a patient. There are a significant number of total joint replacements performed each year in the United States, and the procedures are considered relatively safe and effective. However, some patients will experience prosthesis failure. Risk factors for failure include male gender, age younger than 55 years at the time of surgery, obesity, and the presence of comorbidities. In terms of factors related to the surgeon, greater procedure volume (both of the surgeon and the facility), prosthesis choice, and surgical technique (e.g., proper alignment of the prosthesis) all contribute to better patient outcomes . It is important to note that both knee and hip replacement are associated with a high risk of deep vein thrombosis (DVT) and pulmonary embolism compared with other surgeries. Without prophylaxis, DVT will develop in most patients . Therefore, prophylactic treatment, usually with either low-molecular-weight heparin or warfarin, is recommended for patients undergoing one of these procedures, unless contraindications are present. In general, total joint replacement is reserved for patients for whom other treatments have been ineffective. Range-of-motion exercises and individualized exercise programs prescribed by a physical therapist can also delay the loss of joint function. Joint protection techniques, heat and cold treatments, and splints or orthotic devices to support and align joints may be of assistance [4,9,12]. Some therapists will use specialized devices to apply deep heat or electrical stimulation to reduce pain and improve joint mobility [4,9,12]. Occupational therapists can construct splints for the hand and wrist and teach patients with RA how to protect and use their joints most effectively. In addition to physiotherapy, occupational therapists can also show patients with RA how to better cope with limitations that can affect their daily tasks at work and at home. For example, many clinicians have recommended frequent rest periods between activities and proper sleeping habits (e.g., 8 to 10 hours of sleep per night) . The use of complementary and alternative medicine (CAM) is on the rise among the general population, and its use for the treatment of RA is extremely commonplace among individuals in the United States, despite a lack of evidence for the long-term benefit of many of these practices [73,74,75]. According to the National Institutes of Health, 40.9% of patients with RA used CAM in 2012, compared with 24.1% in the healthy population. Some estimate the prevalence of CAM use among patients with RA to be as high as 90% [76,77,78]. A 2014 survey of 855 African American patients with RA found that 98% had ever engaged in CAM activities, 95% had ever used CAM treatments, and 51% had visited a CAM provider . CAM use varies significantly between cultural/social groups, and as such, it may be difficult to draw overall prevalence data from this study. However, it is known that patients with symptoms of severe pain are more likely to engage in self-treatment, nutritional supplementation, and unconventional approaches to coping and healing than those with less symptomatic arthritis . CAM use among the elderly has many potential implications, including altered pharmacokinetics, comorbidities, and polypharmacy of potentially toxic drugs . Patients may also choose alternatives because conventional medicine offers no cure, symptoms persist despite conventional therapy, CAM offers a relatively favorable risk/benefit ratio compared with pharmacotherapy, and/or their culture or society supports the use of CAM. Nearly 15% of CAM users cite healthcare costs as an impetus [81,82]. Despite the fact that no evidence exists to support the use of CAM for long-term improvement in RA, short-term relief of symptoms is often realized with various CAM therapies . CAM encompasses a wide range of therapeutic practices, from modified diets and the use of herbal medications (HMs) and other natural products (NPs) to yoga and tai chi exercises. Other therapies, such as acupuncture, biofeedback, chiropractic medicine, homeopathy, hypnosis, massage, meditation, naturopathy, osteopathy, prayer, and traditional cultural medicine (e.g., Chinese, Native American, Ayurveda, Siddha, Unani), are all considered CAM because they fall outside the realm of conventional Western medicine; however nonvitamin, nonmineral natural products are the most commonly used category of CAM, followed by deep breathing, meditation, and massage therapy . For healthcare professionals, the major significance of CAM use (especially HMs and NPs) by patients with RA is that it goes unreported about 50% to 70% of the time, and some modalities can modify the efficacy of medications being taken concurrently or cause serious adverse effects when combined with pharmaceuticals . Most often, patients say they are simply not asked about use, but are generally forthcoming about CAM with their physicians when discussion is initiated. A very small minority feel that healthcare professionals are ignorant and skeptical of CAM and will only admonish them for use; nonetheless, inquiring about CAM, while remaining nonjudgmental, is advised to gain a clear understanding of all the factors involved. Aside from supplementation with several specific types of oils, the only complementary therapy currently endorsed by the U.S. Department of Health and Human Services for patients with RA is to consume a nutritious, balanced diet . Some argue that the typical American diet, which is based on animal proteins (many of which are now devoid of significant levels of nutrients and/or are heavily processed) and typically consisting of high levels of animal fats (e.g., cheese, butter, ice cream) and simple carbohydrates promotes inflammation. However, others argue that restricting the intake of good quality food sources of nutrients, such as fish and real cheese, can lead to dietary deficiencies. A growing body of evidence supports the belief that proper nutrition from food, or more specifically, avoidance or correction of nutritional deficiencies, can prevent the development of inflammatory disorders in genetically predisposed individuals. One group of researchers writes that, "diet can affect transgenerational gene expression via 'reversible' heritable epigenetic mechanisms" . It is believed that certain anti-inflammatory bioactive food components (e.g., carotenoids, organosulfurs, polyphenols, phytosterols, tocopherols, tocotrienols) can lessen the rates and negative effects of acetylation, methylation, oxidation, phosphorylation, ribosylation, SUMOylation, and ubiquitination. One food-sourced supplement, fish oil, is a proven, powerful RA therapy and contains several bioactive components, such as the omega-3 fatty acids docosahexaenoic acid (DHA) and eicosapentaenoic acid (EPA). A 2010 meta- and mega-analysis of randomized controlled trials confirmed the efficacy of fish oil for the relief of joint pain and found a significantly reduced use of anti-inflammatory drugs in patients with long-standing RA . A 2015 randomized controlled trial examined the effects of high versus low doses of fish oil in early RA by employing a treat-to-target protocol of combination DMARDs . DMARD-naïve patients with RA of less than 12 months' duration were randomized to either fish oil at high dose (5.5 g/day) or low dose (0.4 g/day), considered the control. All patients received methotrexate, sulphasalazine, and hydroxychloroquine, with doses adjusted to account for disease activity and toxicity. Reported results included lower failure of triple DMARD therapy and significantly greater remission in the high-dose group compared with the control group, with no differences in dose of methotrexate, health assessment results, or adverse events . NSAIDs can cause an increased cardiovascular risk, and reduced morbidity and mortality among participants in the research groups was also attributable to fish oil supplementation, as atherosclerosis and NSAID use are both reduced with this therapy. Past research was limited to long-standing cases of RA; it is unclear whether fish oil can prevent joint damage in recent-onset RA [85,87]. Though fish oil is most often studied, krill oil (from a small, shrimp-like crustacean) has also shown similarly beneficial results . It should be noted that concerns over bleeding risks (e.g., hemorrhagic stroke) related to a high intake of fish oil have been shown to be unfounded . However, blood thinning is a side effect, and patients should be advised to eat foods rich in vitamin K1 while taking these supplements. Other HMs and NPs have received attention for the treatment of RA and have been or are currently being studied, including gamma-linolenic acid (from evening primrose, borage, and black currant), thunder god vine extract (used in traditional Chinese medicine), nettle leaf, turmeric, frankincense, ginger, and green tea. However, the results are either inconsistent or inconclusive or the risk profile of the product is of concern . Thunder god vine, in particular, has many negative side effects in large doses . Mind-body therapies, such as tai chi, yoga, meditation, biofeedback, imagery, and relaxation, have shown positive correlations with coping and mood disorders associated with RA, but have no significant, lasting effects on pain and the other physical symptoms of RA . The danger to patients who rely exclusively on CAM for the treatment of recent-onset RA is that the disease will progress unchecked. In addition to the medical management of RA, several lifestyle changes may improve symptom severity and decrease the number of flare-ups. The National Institute of Arthritis and Musculoskeletal and Skin Disorders recommends advising patients regarding rest and exercise, use of orthotic devices, stress reduction, and healthful diet . It can be empowering for some patients to feel that they have an active role in their own rehabilitation and care. Therefore, primary care providers may consider advising patients to exercise for general health and RA-symptom benefits. Although there are no U.S. guidelines established addressing the role of exercise in the management of RA, several Canadian and European organizations have published recommendations. The American College of Rheumatology recommends that all patients improve general fitness and exercise regularly, focusing on moderate-intensity, weight-bearing (strengthening) activities and flexibility (range-of-motion) exercises . The Ottawa Panel has made recommendations regarding exercise and physical therapy for patients with RA, advocating for the incorporation of specific functional strengthening and low-intensity whole-body exercises . The Panel found that more intense exercise was associated with symptom exacerbation and damage to affected joints. In general, exercise has been found to improve pain, upper-limb (grip) and lower-limb force, functional status, overall function, and number of sick days, which was noted to be of particular importance due to its socioeconomic impact . The use of splints may be useful in some patients, particularly for short periods of time . The devices work by providing rest, support, and stabilization of the affected joint. Most often, the hand and wrist joints are splinted, but the foot and ankle may also be amenable to these devices. Several studies have failed to show a significant improvement in symptoms as a result of splinting upper limbs, although working wrist splints may reduce pain and improve grip, and mixed evidence supports the use of splinting on lower limbs [92,93,94,95,96]. There is also some support of the practice of nighttime splinting to prevent "swan neck" deformities in affected finger joints . Stress has been proven to exacerbate the proinflammatory load associated with RA, and it can be a significant contributor to more severe disease . One study found that chronic interpersonal stress was associated with greater stimulated cellular production of IL-6 among patients with RA . This can lead to increased sensitization to pain and engagement in the stress cycle. Patients who are also depressed may experience a heightened response to stressful events . Interventions designed to lessen stress and/or enhance stress coping skills (e.g., biofeedback, breathing techniques, meditation, yoga, mindfulness) may improve symptoms in these patients . RA is not solely a disease of joint destruction; it can involve almost all organs. The numerous extra-articular manifestations of RA will be further discussed in the following sections (Table 4) . Pleuritis Clinical judgment and exudation verified by chest x-ray. Other causes improbable. RA may cause inflammation of the outer cardiac lining (pericarditis) and cardiac muscle (myocarditis), leading to congestive heart failure. In a population-based cohort study, patients with RA had a significantly higher risk of cardiovascular disease than those without RA . More than half of the patients 50 to 59 years of age and all of those older than 60 years of age with a new diagnosis of RA had a more than 10% increased risk of cardiovascular disease within 10 years of RA onset. Patients who have RA are less likely to report angina symptoms than those who do not; they are also more likely to experience both unrecognized myocardial infarction and sudden cardiac death . The risk of coronary artery disease in patients with RA cannot be explained by an increased incidence of traditional coronary artery disease risk factors . The Nurses' Health Study evaluated the incidence of the composite end point of fatal and nonfatal myocardial infarction and stroke in 527 women diagnosed with RA . The incidence of an adverse cardiac event was significantly higher in women with RA of longer duration than in women without RA (272 cases versus 96 cases per 100,000 person-years; relative risk: 3.1) . The frequency of hypertension, diabetes, and high cholesterol was comparable between women with RA and those without. Compared with women without RA, women with RA were more likely to have a parental history of myocardial infarction before 60 years of age. Body mass index was slightly less and physical activity levels were significantly lower for participants with RA than those without. In a study by del Rincon and colleagues comparing the incidence of cardiovascular-related hospitalizations, procedures, or deaths in patients with and without RA, the incidence of cardiovascular events was significantly higher among those with RA (3.43 versus 0.59 per 100 person-years) . In an observational studies meta-analysis, Aviña-Zubieta and colleagues showed that cardiovascular disease mortality increased by about 50% in patients who had RA compared those who did not have the disease . Thus, a clear connection appears between cardiac disease and RA. Pulmonary manifestations are also seen in patients with RA. There are several types of potential pulmonary manifestations of RA: pleural disease, interstitial pneumonitis, and fibrosis. Pleural effusions and pulmonary rheumatoid nodules are the most common manifestations, along with high rheumatoid factor titers [109,110,111]. Pleuritis is more often found in autopsies of patients with RA than in living patients. In about 20% of patients, pleuritis develops concurrently with RA onset . Although pleuritic pain is not usually a major complaint, the effusions may be large enough to cause dyspnea. Pulmonary fibrosis can either be slowly progressive or result from pulmonary inflammatory disease; on physical exam of the lungs, they present with fine, diffuse, dry rales. Early in the disease, patients with RA may develop pulmonary mononuclear cell infiltrate-associated interstitial lung disease; in later phases of interstitial lung disease, these patients develop pulmonary fibrosis [111,112]. Symptomatic interstitial lung disease occurs in approximately 3% to 14% of patients with RA, whereas detailed pulmonary function testing and autopsy studies have indicated that 35% to 60% of patients with RA have evidence of interstitial lung disease and pulmonary fibrosis [102,113,114]. Risk factors for the development of interstitial lung disease include smoking and disease severity (as measured by a disability assessment), although some studies found no correlation between disease severity and interstitial lung disease in patients with RA [114,115]. Patients with RA who smoke are at a higher risk for fibrotic complications in the lungs than are patients in the general population. Vasculitis is a term used to group extra-articular complications of RA that are related to inflammatory vascular disease. The initial pathologic change in RA often includes inflammatory changes in medium and small blood vessels. These patients can develop skin ulcerations, infections, or neuropathy affecting the brain, nerves, and heart, consequently causing stroke, myocardial infarction, or heart failure [4,9,12]. Retinal vasculitis, a potentially disabling condition, also has been reported . Systemic rheumatoid vasculitis, one of the most feared complications of RA, has become less prevalent in recent decades. This decline in rheumatoid vasculitis likely relates to the marked improvement in therapy resulting from widespread use of methotrexate and the new biologic agents. The associated neuropathy is of a distal sensory or sensorimotor type. Dermatologic manifestations may include nail-fold infarcts, skin ulcerations, or gangrene . There is a strong association between rheumatoid factor levels and the development of vasculitis in patients with RA, usually caused by intravascular deposition of immune complexes containing rheumatoid factor and immunoglobulin from complement-mediated vascular damage [102,118,119,120]. Ocular involvement is another major manifestation of RA, usually manifesting as scleritis, development of anterior uveitis, and peripheral ulcerative keratitis (corneal melt) [121,122]. These disorders are associated with inflammatory cytokines produced by ocular mononuclear cell infiltrates [122,123]. There appears to be a correlation between RA disease scale and scleritis development . However, unlike many other systemic RA manifestations, ocular involvement may be independent of RA disease activity . Patients with RA can also develop secondary Sjögren syndrome, associated with keratoconjunctivitis sicca (dryness of the conjunctiva and cornea) . There is an association between rheumatoid factor levels and keratoconjunctivitis sicca in patients with RA . Secondary Sjögren syndrome is also associated with salivary and lacrimal gland inflammatory changes with mononuclear cell infiltration [121,126]. Osteopenia and osteoporosis are very common extra-articular complications in patients with RA . The development of osteopenia in patients with RA appears to occur independent of corticosteroid use and is directly linked to elevated levels of the RANK ligand expressed by T cells, which promotes osteoclastic bone resorption [128,129,130]. Osteopenia in RA is directly associated with inflammation markers . The periarticular osteopenia that occurs in patients with RA is likely related to high local levels of IL-1 and TNF-alpha, which are produced in inflamed RA synovium and augment RANK ligand production . Hematologic abnormalities, especially anemia, are present in the majority of patients with RA [132,133]. Anemia of chronic disease is commonly present in patients with RA, and its severity is directly related to high levels of inflammatory cytokines, such as TNF-alpha, IL-1, and IL-6 [132,134,135,136]. Thrombocytosis is another common hematologic finding, correlating with disease activity and inflammation markers [137,138]. High rheumatoid factor and disease activity level (as measured by physical exam and by CRP and ESR levels) is seen with the development of Felty syndrome (defined by the presence of RA, splenomegaly, and neutropenia), large granulocytic leukemia, and non-Hodgkin lymphoma in patients with RA [132,139]. Rheumatoid nodules occur in 20% of patients with RA . Most commonly they are subcutaneously developed in pressure areas (e.g., the elbows and finger joints). In addition, they can occasionally affect internal organs elsewhere in the body, including pleura, lungs, meninges, and larynx . The mature rheumatoid nodule has a central area of necrosis rimmed by a corona of palisading fibroblasts that is surrounded in turn by a collagenous capsule with perivascular collections of chronic inflammatory cells. Careful histologic study suggests that development of the nodule is mediated through affected small arterioles and resulting complement activation and terminal vasculitis . This immunologic response is linked to proliferation of resident histiocytes and fibroblasts and to an influx of macrophages from the circulation . Rheumatoid factor is almost always found in the serum of patients with rheumatoid nodules, which are rarely present in the absence of obvious arthritis . Cervical spine (atlanto-axial) instability may be observed in patients with established RA who have both degeneration of the ligaments and bone in the cervical spine . Transverse ligament degeneration may lead to C1–C2 level instability [4,6,9,12]. As a result of this inherent instability, minor trauma can lead to neurologic sequelae. Thus, patients with RA must be examined carefully after minor falls, motor vehicle accidents, or other injuries. In addition, cervical spine injury may occur spontaneously [4,6,9,12]. The earliest and most common symptom of cervical subluxation is pain radiating up into the occiput . Two other serious, but less common, clinical patterns include slow progressive quadriparesis with sensory loss in the hands and medullary dysfunction associated with vertical penetration of the dens. In addition, paresthesias in the shoulders and arms may occur with head movement . Although RA is a lifelong illness, there have been significantly improved trends in disease management. For example, DMARD combination therapy has been shown to have better treatment outcomes than individual DMARD therapy in patients with high disease activity. Combinations of methotrexate and the newer biologic DMARD agents can lead to remission in 30% to 40% of patients with RA, but sustained remission is observed in only 17% to 20% of patients [27,30,146]. As treatment for RA has improved, severe disability and life-threatening complications have decreased considerably and many people not in clinical remission live relatively normal lives with low levels of disease activity. As most patients with RA will be utilizing pharmacotherapy, regular blood or urine tests should be performed to evaluate the efficacy and incidence of adverse effects related to medication. Because RA may cause eye complications, patients should have regular eye exams. In addition, patients with RA should have yearly cardiovascular assessment examinations. A 2013 study compared patient-assessed, physician-assessed, and musculoskeletal ultrasound-assessed disease activity in patients with RA that was considered by their rheumatologists to be in clinical remission . Using the Simplified Disease Activity Index, patient self-assessment and physician assessment of remission status were similar (14.5% and 11.6% of patients, respectively). Using a modified version of the Disease Activity Score, the DAS28, 26% of patients had achieved clinical remission based on self-assessment, compared with 52% based on physician assessment (not the patients' regular physician). Patient-physician agreement on the tender joint count portion of the assessment was high, but agreement was lower for the swollen joint count portion. Neither patients nor physicians accurately predicted ultrasound synovitis findings, but physicians were more accurate. Radiologic assessment scales also are useful . Treatment should be guided by individual clinical response to various interventions. Changes in hemoglobin, ESR, and CRP may serve as helpful indicators of response to treatment, but platelet count and rheumatoid factor levels tend not to correlate well with indicators of treatment . In addition to guidelines specific to RA disease management, guidelines for the management of the extra-articular manifestations (e.g., cardiovascular manifestations) of RA have been published by the EULAR . Language and cultural barriers have the potential for far-reaching effect, given the growing percentages of racial/ethnic populations. As noted, patient understanding of the risks and benefits of treatment options is an essential aspect of the care of patients with RA, and it must be assured that all patients have a clear understanding of the concepts discussed. When there is an obvious disconnect in the communication process between the practitioner and patient due to the patient's lack of proficiency in the English language, an interpreter is required. According to U.S. Census Bureau data from 2015, nearly 41.7 million Americans are foreign-born, and more than 25 million of them (8.6% of the population) speak English less than "very well" . Clinicians should ask their patients what language they prefer for their medical care information, as some individuals prefer their native language even though they have said they can understand and discuss symptoms in English . Translation services should be provided for patients who do not understand the clinician's language. "Ad hoc" interpreters (family members, friends, bilingual staff members,) are often used instead of professional interpreters for a variety of reasons, including convenience and cost. However, clinicians should check with their state's health officials about the use of ad hoc interpreters, as several states have laws about who can interpret medical information for a patient . Even when allowed by law, the use of a patient's family member or friend as an interpreter should be avoided, as the patient may not be as forthcoming with information and the family member or friend may not remain objective . Children should especially be avoided as interpreters, as their understanding of medical language is limited and they may filter information to protect their parents or other adult family members . Individuals with limited English language skills have actually indicated a preference for professional interpreters rather than family members . Most important, perhaps, is the fact that clinical consequences are more likely with ad hoc interpreters than with professional interpreters . A systematic review of the literature showed that the use of professional interpreters facilitates a broader understanding and leads to better clinical care than the use of ad hoc interpreters, and many studies have demonstrated that the lack of an interpreter for patients with limited English proficiency compromises the quality of care and that the use of professional interpreters improves communication (errors and comprehension), utilization, clinical outcomes, and patient satisfaction with care [156,157]. Although RA is a physical disease, its effects on a patient's life are wide-ranging, affecting mental health, self-esteem, and ability to function socially and occupationally . Many of the issues that arise for these patients are the result of dealing with a chronic, incurable illness. The problems associated with chronic illness will ultimately color the various domains of a patient's life, including physical, psychologic, economic, and social dimensions. As noted, RA can affect patients' abilities to continue functioning in their daily activities, such as self-care, going to work or school, participating in recreational activities, and continuing with activities the patient enjoyed prior to the chronic condition . Nearly one-quarter of women discontinue working within four years of RA diagnosis . Even with appropriate pharmacologic treatment, up to 50% of patients will be too disabled to work within 10 years of RA onset . Because of the nature of RA, with its symptoms being long-term, the patient is continually reminded of his/her condition . The symptoms include not only those related to the chronic illness, but the side effects from the treatment that is prescribed . Taylor, Jones, and Burns argue that symptoms are continual symbols for the patient . On an abstract level, symptoms symbolize psychosocial loss such as helplessness, grief, and powerlessness . Ultimately, how a patient perceives the symptoms will affect the course of the illness. Patients who are resigned to their symptoms will passively accept them, while those patients who view them as challenges will engage forcefully and actively to combat them . Loss and sorrow and the ensuing grief are characteristic of patients coping with any chronic illness, including RA . There is grief of the loss of physical functioning . Variables such as age, gender, health before the diagnosis of the illness, and the patient's existing social support influence what types of losses will be experienced . Both the patient and family members grieve and mourn over the loss of the person who once was and previous abilities . Some have termed this "chronic sorrow" because, although the patient may have accepted the diagnosis, the feelings of grief and loss continue to wax and wane throughout the course of the illness . Patients may experience fears and anxiety about their own future, that of their children's future, and the effect of the illness on relationships . Having RA may influence decisions regarding childbearing and family planning . Patients may have concerns about their own sense of attractiveness that affect their outlook, sense of self-esteem, and body image [161,164]. Body image, for example, is an unconscious mental representation of one's body and is influenced by a host of factors including attitudes, sensory and physical sensations, and interpersonal interactions, all of which can be affected by RA . As previously noted, there is a significant association between depression and RA, with one study indicating that almost 40% of patients with RA self-reported depression after nine years . The major predictors of depression in patients with RA are fatigue and pain severity and extent, although other measures, including comorbidity, inactivity, and duration of illness, have also been found to be significant . In one study, depressed patients with RA tended to be younger female patients with lower household income, less employment, and greater work disability . Because functional disability will have greater socioeconomic impact in lower income populations, it is hypothesized that this group is at increased risk for developing depressive symptoms . Because depression is so prevalent among patients with RA, rheumatologists and primary care providers should consider assessing for depressive symptoms among their patients, especially among those with worse functional statuses . Research indicates that communication with patients with RA regarding depressive symptoms is a key aspect of identifying and effectively treating the condition before it becomes more severe . Despite its known importance, one study found that depression was only discussed in 25% of primary care visits, with patients initiating the discussion more than half of the time . RA is not only an emotional drain, but also a financial drain on patients and family members. Because of the debilitating effects of the illness, patients may find themselves giving up their jobs. Some may find it necessary to give up their homes and return to live with their parents . Even if a patient has health insurance, there are often out-of-pocket expenses that are not covered by insurance. Finally, the patient's family may also experience loss of income . Because of their limited functional abilities, some patients with RA may decrease their level of participation in social activities, altering their social network relationships . It may even affect developmental tasks such as finding a partner, having children, or moving to the next phase of their career . Developmental transitions are normal aspects of life, and accomplishing developmental tasks can bring about stress. However, the uncertainty of RA compounds these difficulties; it influences how the patient views his/her chronic condition and ultimately affects the family system [160,171]. Chronic illness inevitably sets a different tone for the individual and the family. Adolescence is characterized as a period of confusion and turmoil. Erik Erikson noted that one of the main developmental tasks for the adolescent is the search for identity, and adolescents who achieve a sense of identity will experience well-being (i.e., a sense of knowing where they are going and a comfort level with their body). In their search for identity, adolescents wrestle with the perception that they are different from their peers . Social acceptance is one of the major concerns for adolescents. However, the chronically ill adolescent is often isolated from other teenagers and spends a large amount of time with adult caregivers and healthcare professionals. Rejection and isolation from peers may contribute to even greater stress . Indeed, studies have found that when the chronically ill adolescent has frequent peer contacts during their illness, psychosocial outcomes are improved . And when healthy counterparts have increased interactions with the adolescent who is chronically ill, prejudicial attitudes held by the healthy peers decrease . Adolescence is also a period marked by tremendous biologic changes. It has been documented that adolescents who are chronically ill express more anxiety about their height and weight . Research has also indicated that adolescents with chronic pain view themselves as less developmentally advanced than their peers, a finding that was influenced by level of peer interaction and pain severity . Early adulthood years emphasize finding a place in a vocational niche, establishing intimacy with others, and selecting goals for life. Intimacy with others entails interactions with others, which in turn are affected by one's own perceptions of oneself as competent and valuable . RA may interrupt this process of achieving intimacy, forcing patients to isolate themselves. Patients in early adulthood who have achieved relationships prior to the diagnosis of the illness struggle with maintaining levels of intimacy with spouses and children. Some will wrestle with whether they should have children or additional children . For those who have to give up jobs or careers, they may feel unproductive and unsuccessful . One of the major developmental tasks, according to Erikson, during the middle-age years is generativity versus stagnation. Tasks of generativity involve productivity and giving back to society . However, patients with RA who are navigating this developmental stage may feel unanchored, grieve over missed opportunities, and feel anxious about their lack of ability to contribute financially or socially [160,175]. In older age, the major developmental task as defined by Erikson is integrity versus despair. This involves a review of life accomplishments and acceptance of one's life . Major issues include dealing with loss and developing a point of view regarding death. RA can be especially debilitating, both physically and psychologically, in this stage of life. RA is a potentially debilitating illness that affects work, interpersonal relationships, and overall quality of life. Healthcare professionals should be familiar with the common symptoms and proper diagnostic modalities in order to treat individuals with this disease . They should also be familiar with emerging treatment regimens and extra-articular disease manifestations. Standard therapies can relieve symptoms in some patients and provide partial improvement in others. However, some patients may have more refractory disease, whereby significant disease persists despite treatment. Knowledge of emerging therapies can be particularly helpful to these patients' outcomes. Effectively treating RA, whether by standard therapy or emerging treatments, can be beneficial to the healthcare system and patients. The Arthritis Foundation is the largest private, not-for-profit contributor to arthritis research in the world, funding more than $450 million in research grants since 1948. The foundation helps people take control of arthritis by providing public health education; pursuing public policy and legislation; and conducting evidence-based programs to improve the quality of life for those living with arthritis. The Arthritis Foundation offers information and tools to help people live a better life with arthritis. The American College of Rheumatology is an organization of and for physicians, health professionals, and scientists that advances rheumatology through programs of education, research, advocacy, and practice support that fosters excellence in the care of people with arthritis and rheumatic and musculoskeletal disease. The vision is for a world where people with arthritis live the fullest life possible, with the ability to pursue valued life activities with minimal pain. The mission of the CDC is to improve the quality of life of people affected by arthritis by short-term goals (improve and increase self-management attitudes and behaviors, increase early diagnosis and appropriate pain management) and long-term goals (decrease pain and disability among persons, improve physical, psychosocial, and work function). 1. Myasoedova E, Crowson CS, Kremers HM, Therneau TM, Gabriel SE. Is the incidence of rheumatoid arthritis rising? Results from Olmsted County, Minnesota, 1955–2007. Arthritis Rheum. 2010;62(6):1576-1582. 2. Centers for Disease Control and Prevention. National Ambulatory Medical Care Survey: 2013 State and National Summary Tables. Available at https://www.cdc.gov/nchs/data/ahcd/namcs_summary/2013_namcs_web_tables.pdf. Last accessed April 6, 2017. 3. Centers for Disease Control and Prevention. Prevalence of doctor-diagnosed arthritis and arthritis-attributable activity limitation—United States, 2010–2012. MMWR. 2013;62(44):869-873. 4. National Institute of Arthritis and Musculoskeletal and Skin Diseases. Rheumatoid Arthritis. Washington, DC: National Institutes of Health, U.S. Department of Health and Human Services; 2009. 5. Yelin E, Cisternas M, Foreman A, Pasta D, Murphy L, Helmick CG. National and state medical expenditures and lost earnings attributable to arthritis and other rheumatic conditions: United States, 2003. MMWR. 2007;56(1):4-7. 6. Firestein GS. Etiology and pathogenesis of rheumatoid arthritis. In: Firestein GS, Budd RC, Gabriel SE, McInnes IB, O'Dell JR (eds). Kelley's Textbook of Rheumatology. 9th ed. Philadelphia, PA: Elsevier/Saunders; 2013: 1059-1069. 7. Dunlop DD, Lyons JS, Manheim LM, Song J, Chang RW. Arthritis and heart disease as risk factors for major depression: the role of functional limitation. Medical Care. 2004;42(6):502-511. 8. Goodson N, Marks J, Lunt M, Symmons D. Cardiovascular admissions and mortality in an inception cohort of patients with rheumatoid arthritis with onset in the 1980s and 1990s. Ann Rheum Dis. 2005;64(11):1595-1601. 9. Rindflesich JA, Muller D. Diagnosis and management of rheumatoid arthritis. Am Fam Physician. 2005;72(6):1037-1047. 10. Goldring SR. A 55-year-old woman with rheumatoid arthritis. JAMA. 2000;283(4):524-531. 11. Aletaha D, Neogi T, Silman AJ, et al. 2010 rheumatoid arthritis classification criteria: an American College of Rheumatology/European League Against Rheumatism collaborative initiative. Arthritis Rheum. 2010;62(9):2569-2581. 12. O'Dell JR. Rheumatoid arthritis. In: Goldman L, Schafer AI (eds). Goldman-Cecil Medicine. 25th ed. Philadelphia, PA: Saunders Elsevier; 2015. 13. Smith HR, Brown A. Rheumatoid Arthritis. Available at http://emedicine.medscape.com/article/331715-overview. Last accessed April 6, 2017. 14. Pincus T, Sokka T. Laboratory tests to assess patients with rheumatoid arthritis: advantages and limitations. Rheum Dis Clin N Am. 2009;35(4):731-734. 15. British Columbia Medical Association. Rheumatoid Arthritis: Diagnosis, Management, and Monitoring. Available at http://www2.gov.bc.ca/gov/content/health/practitioner-professional-resources/bc-guidelines/rheumatoid-arthritis. Last accessed April 6, 2017. 16. Andersson ML, Svensson B, Petersson IF, et al. Early increase in serum-COMP is associated with joint damage progression over the first five years in patients with rheumatoid arthritis. BMC Musculoskelet Disord. 2013;14:229. 17. Crescendo Bioscience. What is Vectra DA? Available at https://vectrada.com/patients/. Last accessed April 6, 2017. 18. Curtis JR, van der Helm-van Mil AH, Knevel R, et al. Validation of a novel multibiomarker test to assess rheumatoid arthritis disease activity. Arthritis Care Res (Hoboken). 2012;64(12):1794-1803. 19. Vectra DA. Available at https://vectrada.com/. Last accessed April 6, 2017. 20. Lozada CJ, Culpepper SS. Osteoarthritis Workup. Available at http://emedicine.medscape.com/article/330487-workup#c11. Last accessed April 6, 2017. 21. McGonagle D, Tan AL. What magnetic resonance imaging has told us about the pathogenesis of rheumatoid arthritis: the first 50 years. Arthritis Res Ther. 2008;10(5):222. 22. Fujikawa K, Kawakami A, Tamai M, et al. High serum cartilage oligomeric matrix protein determines the subset of patients with early-stage rheumatoid arthritis with high serum C-reactive protein, matrix metalloproteinase-3, and MRI-proven bone erosion. J Rheumatol. 2009;36(6):1126-1129. 23. García-Arias M, Pascual-Salcedo D, Ramiro S, et al. Calprotectin in rheumatoid arthritis: association with disease activity in a cross-sectional and a longitudinal cohort. Mol Diagn Ther. 2013;17(1):49-56. 24. Goodman A. Novel Biomarkers Improve Diagnosis in Early RA. Available at http://www.medscape.com/viewarticle/806614. Last accessed April 6, 2017. 25. De Winter L, Hansen W, Geusens P, et al. New autoantibodies as biomarkers for early and seronegative rheumatoid arthritis.Ann Rheum Dis. 2013;72(Suppl 3):114. 26. De Winter LM, Hansen WL, van Steenbergen HW, et al. Autoantibodies to two novel peptides in seronegative and early rheumatoid arthritis. Rheumatology (Oxford). 2016;55(8):1431-1436. 27. O'Dell JR. Clinical features of rheumatoid arthritis. In: Firestein GS, Budd RC, Gabriel SE, McInnes IB, O'Dell JR (eds). Kelley's Textbook of Rheumatology. 9th ed. Philadelphia, PA: Elsevier/Saunders; 2013: 1109-1136. 28. Akil M, Amos RS. ABC of rheumatology: rheumatoid arthritis. I: clinical features and diagnosis. BMJ. 1995;310(6979):587-590. 29. Venables PJW, Maini RN. Diagnosis and Differential Diagnosis of Rheumatoid Arthritis. Available at http://www.uptodate.com/contents/diagnosis-and-differential-diagnosis-of-rheumatoid-arthritis. Last accessed April 6, 2017. 30. American College of Rheumatology Committee to Reevaluate Improvement Criteria. A proposed revision to the ACR20: the hybrid measure of American College of Rheumatology response. Arthritis Rheum. 2007;57(2):193-202. 31. Hochberg MC, Chang RW, Dwosh I, Lindsey S, Pincus T, Wolfe F. The American College of Rheumatology 1991 revised criteria for the classification of global functional status in rheumatoid arthritis. Arthritis Rheum. 1992;35(5):498-502. 32. Smolen JS, Landewé R, Bijilsma J, et al. EULAR recommendations for the management of rheumatoid arthritis with synthetic and biological disease-modifying antirheumatic drugs. : 2016 update. Ann Rheum Dis. 2017;0:1-18. 33. Jurgens MS, Welsing PM, Jacobs JW. Overview and analysis of treat-to-target trials in rheumatoid arthritis reporting on remission. Clin Exp Rheumatol. 2012;30(4 Suppl 73):S56-63. 34. Boers M. Rheumatoid arthritis: treatment of early disease. Rheum Dis Clin North Am. 2001;27(2):405-414. 35. Singh JA, Saag KG, Bridges SL Jr, et al. 2015 American College of Rheumatology guideline for the treatment of rheumatoid arthritis. Arthritis Care Res. 2016;68(1):1-26. 36. Goekoop-Ruiterman YP, de Vries-Bouwstra JK, Allaart CF, et al. Comparison of treatment strategies in early rheumatoid arthritis: a randomized trial. Ann Intern Med. 2007;146(6):406-415. 37. Pincus T, O'Dell JR, Kremer JM. Combination therapy with multiple disease-modifying antirheumatic drugs in rheumatoid arthritis: a preventive strategy. Ann Intern Med. 1999;131(10):768-774. 38. Olsen NJ, Stein CM. New drugs for rheumatoid arthritis. N Engl J Med. 2004;350(21):2167-79. 39. van Eijk IC, Nielen MM, van der Horst-Bruinsma I, et al. Aggressive therapy in patients with early arthritis results in similar outcome compared with conventional care: the STREAM randomized trial. Rheumatology (Oxford). 2012;51(4):686-694. 40. LexiComp Online. Available at http://online.lexi.com. Last accessed April 6, 2017. 41. American College of Rheumatology. Rheumatoid Arthritis: How is Rheumatoid Arthritis Treated? Available at http://www.rheumatology.org/I-Am-A/Patient-Caregiver/Diseases-Conditions/Rheumatoid-Arthritis. Last accessed April 6, 2017. 42. Cohen S, Cannon GW, Schiff M, et al. Two-year, blinded, randomized, controlled trial of treatment of active rheumatoid arthritis with leflunomide compared with methotrexate. Arthritis Rheum. 2001;44(9):1984-1992. 43. Singer O, Gibofsky A. Methotrexate versus leflunomide in rheumatoid arthritis: what is new in 2011? Curr Opin Rheumatol. 2011;23(3):288-292. 44. O'Dell JR, Haire CE, Erickson N, et al. Treatment of rheumatoid arthritis with methotrexate alone, sulfasalazine and hydroxychloroquine, or a combination of all three medications. N Engl J Med. 1996;334(20):1287-1291. 45. Nuki G, Breshnihan B, Bear MB, McCabe D. Long-term safety and maintenance of clinical improvement following treatment with anakinra (recombinant human interleukin-1 receptor antagonist) in patients with rheumatoid arthritis: extension phase of a randomized, double-blind, placebo-controlled trial. Arthritis Rheum. 2002;46(11):2838-2846. 46. Moreland LW. Biologic therapies on the horizon for rheumatoid arthritis. J Clin Rheumatol. 2004;10(suppl):S32-S39. 47. Bathon JM, Martin RW, Fleischmann RM, et al. A comparison of etanercept and methotrexate in patients with early rheumatoid arthritis. N Engl J Med. 2000;343(22):1586-1593. 48. Lipsky PE, Van der Heijde D, St. Clair EW, et al. Infliximab and methotrexate in the treatment of rheumatoid arthritis. N Engl J Med. 2000;343(22):1594-1602. 49. St. Clair EW, van der Heijde FM, Smolen JS, for the Active-Controlled Study of Patients Receiving Infliximab for the Treatment of Rheumatoid Arthritis of Early Onset Study Group. Combination of infliximab and methotrexate therapy for early rheumatoid arthritis: a randomized, controlled trial. Arthritis Rheum. 2004;50(11):3432-3443. 50. Weinblatt ME, Keystone EC, Furst DE, et al. Adalimumab, a fully human anti-tumor necrosis factor alpha monoclonal antibody, for the treatment of rheumatoid arthritis in patients taking concomitant methotrexate: the ARMADA trial. Arthritis Rheum. 2003;48(1):35-45. 51. Goel N, Stephens S. Certolizumab pegol. MAbs. 2010;2(2):137-147. 52. Kay J, Fleischmann R, Keystone E, et al. Golimumab 3-year safety update: an analysis of pooled data from the long-term extensions of randomised, double-blind, placebo-controlled trials conducted in patients with rheumatoid arthritis, psoriatic arthritis or ankylosing spondylitis. Ann Rheum Dis. 2015;74(3):538-546. 53. Kay J, Fleischmann R, Keystone E, et al. Five-year safety data from 5 clinical trials of subcutaneous golimumab in patients with rheumatoid arthritis, psoriatic arthritis, and ankylosing spondylitis. J Rheumatol. 2016;43(12):2120-2130. 54. Singh JA, Wells GA, Christensen R, et al. Adverse effects of biologics: a network meta-analysis and Cochrane review. Cochrane Database Syst Rev. 2011;2:CD008794. 55. American College of Rheumatology. Rituximab (Rituxan and MabThera). Available at https://www.rheumatology.org/Practice/Clinical/Patients/Medications/Rituximab_%28Rituxan_and_MabThera%29/. Last accessed April 6, 2017. 56. Pyrpasopoulou A, Douma S, Triantafyllou A, et al. Response to rituximab and timeframe to relapse in rheumatoid arthritis patients: association with B-cell markers. Mol Diagn Ther. 2010;14(1):43-48. 57. American College of Rheumatology. Tocilizumab. Available at https://www.rheumatology.org/Practice/Clinical/Patients/Medications/Tocilizumab_%28Actemra%29/. Last accessed April 6, 2017. 58. Saito S, Kaneko Y, Izumi K, Takeuichi T. Utility of dose frequency adjustment in tocilizumab administration for rheumatoid arthritis. J Rheumatol. 2017;[Epub ahead of print]. 59. Kubota N, Ito M, Sakauichi M, Kobayashi K. Rheumatoid neutrophilic dermatitis in a patient taking tocilizumab for treatment of rheumatoid arthritis. J Dermatol. 2017;[Epub ahead of print]. 60. National Institute for Health and Care Excellence (NICE). Tocilizumab For The Treatment of Rheumatoid Arthritis. Rockville (MD): Agency for Healthcare Research and Quality (AHRQ); 2012. 61. U.S. Food and Drug Administration. [Archive]. FDA Approves Xeljanz for Rheumatoid Arthritis. Available at https://wayback.archive-it.org/7993/20161022200148/http://www.fda.gov/NewsEvents/Newsroom/PressAnnouncements/ucm327152.htm. Last accessed April 6, 2017. 62. Bongartz T, Sutton AJ, Sweeting MJ, et al. Anti-TNF antibody therapy in rheumatoid arthritis and the risk of serious infections and malignancies: systematic review and meta-analysis of rare harmful effects in randomized controlled trials. JAMA. 2006;295(19):2275-2285. 63. Wolfe F. Biologic treatment of rheumatoid arthritis and the risk of malignancy: analyses from a large U.S. observational study. Arthritis Rheum. 2007;56(9):2886-2895. 64. Ramiro S, Gaujoux-Viala C, Nam JL, et al. Safety of synthetic and biological DMARDs: a systematic literature review informing the 2013 update of the EULAR recommendations for management of rheumatoid arthritis. Ann Rheum Dis. 2014;73(3):529-535. 65. Ramiro S, Sepriano A, Chatzidionysiou K, et al. Safety of synthetic and biological DMARDs: a systematic literature review informing the 2016 update of the EULAR recommendations for management of rheumatoid arthritis. Ann Rheum Dis. 2017;[Epub ahead of print]. 66. Welch B. Adalimumab (Humira) for the treatment of rheumatoid arthritis. Am Fam Phys. 2008;78(12):1406-1408. 67. Kirwan JR, for the Arthritis and Rheumatism Council Low-Dose Glucocorticoid Study Group. The effect of glucocorticoids on joint destruction in rheumatoid arthritis. N Engl J Med. 1995;333(3):142-146. 68. American College of Rheumatology. Glucocorticoid-Induced Osteoporosis. Available at https://www.rheumatology.org/Practice/Clinical/Patients/Diseases_And_Conditions/Glucocorticoid-Induced_Osteoporosis/. Last accessed April 6, 2017. 69. van Everdingen AA, Jacobs JW, Siewertsz Van Reesema DR, Bijlsma JW. Low-dose prednisone therapy for patients with early active rheumatoid arthritis: clinical efficacy, disease-modifying properties, and side effects. Ann Intern Med. 2002;136(1):1-12. 70. National Institutes of Health Consensus Development Panel on Total Knee Replacement. Consensus Statement on Total Knee Replacement: Final Statement. Rockville, MD: U.S. Department of Health and Human Services; 2004. 71. Rasul AT Jr, Wright J. Total Joint Replacement Rehabilitation. Available at http://emedicine.medscape.com/article/320061-overview. Last accessed April 6, 2017. 72. Wells G, Li T, Maxwell L, MacLean R, Tugwell P. Determining the minimal clinically important differences in activity, fatigue, and sleep quality in patients with rheumatoid arthritis. J Rheumatol. 2007;34(2):280-289. 73. Rao JK, Mihaliak K, Kroenke K, Bradley J, Tierney WM, Weinberger M. Use of complementary therapies for arthritis among patients of rheumatologists. Ann Intern Med. 1999;131(6):409-416. 74. Tindle HA, Davis RB, Phillips RS, Eisenberg DM. Trends in use of complementary and alternative medicine by U.S. adults: 1997–2002. Altern Ther Health Med. 2005;11(1):42-49. 75. Robinson A, McGrail MR. Disclosure of CAM use to medical practitioners: a review of qualitative and quantitative studies. Complement Ther Med. 2004;12(2-3):90-98. 76. Ernst E, Posadzki P. Complementary and alternative medicine for rheumatoid arthritis and osteoarthritis: an overview of systematic reviews. Curr Pain Headache Rep. 2011;15(6):431-437. 77. Clarke TC, Nahin RL, Barnes PM, Stussman BJ. Use of Complementary Health Approaches for Musculoskeletal Pain Disorders Among Adults: United States, 2012. National Health Statistics Reports, No. 98. Hyattsville, MD: National Center for Health Statistics; 2016. 78. Efthimiou P, Kukar M, Mackenzie CR. Complementary and alternative medicine in rheumatoid arthritis: no longer the last resort! HSS J. 2010;6(1):108-111. 79. Tamhane A, McGwin G Jr, Redden DT, et al. Complementary and alternative medicine use in African Americans with rheumatoid arthritis. Arthritis Care Res (Hoboken). 2014;66(2):180-189. 80. Zhao S, Otieno F, Akpan A, Moots RJ. Complementary and alternative medicine use in rheumatoid arthritis: considerations for the pharmacological management of elderly patients. Drugs Aging. 2017;34(4):255-264. 81. Barnes PM, Bloom B, Nahin RL. Complementary and alternative medicine use among adults and children: United States, 2007. Natl Health Stat Report. 2008;(12):1-23. 82. National Center for Complementary and Alternative Medicine. Rheumatoid Arthritis: In Depth: Other Types of Complementary Health Approaches Studies for Rheumatoid Arthritis. Available at https://nccih.nih.gov/health/RA/getthefacts.htm#hed1. Last accessed April 6, 2017. 83. National Institutes of Health. Handout on Health: Rheumatoid Arthritis. Available at http://www.niams.nih.gov/health_info/Rheumatic_Disease. Last accessed April 6, 2017. 84. Szarc Vel Szic K, Ndlovu MN, Haegeman G, Vanden Berghe W. Nature or nurture: let food be your epigenetic medicine in chronic inflammatory disorders. Biochem Pharmacol. 2010;80(12):1816-1832. 85. James M, Proudman S, Cleland L. Fish oil and rheumatoid arthritis: past, present and future. Proc Nutr Soc. 2010;69(3):316-323. 86. Proudman SM, James MJ, Spargo LD, et al. Fish oil in recent onset rheumatoid arthritis: a randomised, double-blind controlled trial within algorithm-based drug use. Ann Rheum Dis. 2015;74(1):89-95. 87. Arthritis Foundation. The Benefits of Omega-3 Fatty Acids for Arthritis. Available at http://blog.arthritis.org/living-with-arthritis/omega-3-fatty-acids-arthritis/. Last accessed April 6, 2017. 88. Ierna M, Kerr A, Scales H, Berge K, Griinari M. Supplementation of diet with krill oil protects against experimental rheumatoid arthritis. BMC Musculoskelet Disord. 2010;11:136. 89. Watson PD, Joy PS, Nkonde C, Hessen SE, Karalis DG. Comparison of bleeding complications with omega-3 fatty acids + aspirin + clopidogrel versus aspirin + clopidogrel in patients with cardiovascular disease. Am J Cardiol. 2009;104(8):1052-1054. 90. American College of Rheumatology. Exercise and Arthritis. Available at http://www.rheumatology.org/I-Am-A/Patient-Caregiver/Diseases-Conditions/Living-Well-with-Rheumatic-Disease/Exercise-and-Arthritis. Last accessed April 6, 2017. 91. Ottawa Panel. Ottawa Panel evidence-based clinical practice guidelines for therapeutic exercises in the management of rheumatoid arthritis in adults. Phys Ther. 2004;84(10):934-972. 92. Vliet Vlieland TPM. Are static resting wrist splints beneficial in early RA? Nat Clin Pract Rheumatol. 2009;5(3):124-125. 93. Rao S, Baumhauer JF, Tome J, Nawoczenski DA. Orthoses alter in vivo segmental foot kinematics during walking in patients with midfoot arthritis. Arch Phys Med Rehabil. 2010;91(4):608-614. 94. Adams J, Burridge J, Mullee M, Hammond A, Cooper C. The clinical effectiveness of static resting splints in early rheumatoid arthritis: a randomized controlled trial. Rheumatol. 2008;47(10):1548-1553. 95. Veehof MM, Taal E, Willems MJ, van de Laar MAFJ. Determinants of the use of wrist working splints in rheumatoid arthritis. Arthritis Care Res. 2008;59(4):531-536. 96. Ramsey L, Winder RJ, McVeigh JG. The effectiveness of working wrist splints in adults with rheumatoid arthritis: a mixed methods systematic review. J Rehabil Med. 2014;46(6):481-492. 97. van der Giesen FJ, van Lankveld WJ, Kremers-Selten C, et al. Effectiveness of two finger splints for swan neck deformity in patients with rheumatoid arthritis: a randomized, crossover trial. Arthritis Care Res. 2009;61(8):1025-1031. 98. Straub RH, Kalden JR. Stress of different types increases the proinflammatory load in rheumatoid arthritis. Arthritis Res Ther. 2009;11(3):114-115. 99. Davis MC, Zautra AJ, Younger J, Motivala SJ, Attrep J, Irwin MR. Chronic stress and regulation of cellular markers of inflammation in rheumatoid arthritis: implications for fatigue. Brain Behav Immun. 2008;22(1):24-32. 100. Zautra AJ, Parrish BP, Van Puymbroeck CM, et al. Depression history, stress, and pain in rheumatoid arthritis patients. J Behav Med. 2007;30(3):187-197. 101. Pradhan EK, Baumgarten M, Langenberg P, et al. Effect of mindfulness-based stress reduction in rheumatoid arthritis patients. Arthritis Care Res. 2007;57(7):1134-1142. 102. Turesson C, O'Fallon WM, Crowson CS, Gabriel SE, Matteson EL. Extra-articular disease manifestations in rheumatoid arthritis: incidence trends and risk factors over 46 years. Ann Rheum Dis. 2003;62(8):722-727. 103. Hara KS, Ballard DJ, Ilstrup DM, Connolly DC, Vollertsen RS. Rheumatoid pericarditis: clinical features and survival. Medicine (Baltimore). 1990;69(2):81-91. 104. Kremers HM, Crowson CS, Therneau TM, et al. High ten-year risk of cardiovascular disease in newly diagnosed rheumatoid arthritis patients: a population-based cohort study. Arthritis Rheum. 2008;58(8):2268-2274. 105. Maradit-Kremers H, Crowson CS, Nicola PJ, et al. Increased unrecognized coronary heart disease and sudden deaths in rheumatoid arthritis: a population-based cohort study. Arthritis Rheum. 2005;52(2):402-411. 106. Solomon DH, Karlson EW, Rimm EB, et al. Cardiovascular morbidity and mortality in women diagnosed with rheumatoid arthritis. Circulation. 2003;107(9):1303-1307. 107. del Rincón ID, Williams K, Stern MP, et al. High incidence of cardiovascular events in a rheumatoid arthritis cohort not explained by traditional cardiac risk factors. Arthritis Rheum. 2001;44(12):2737-2745. 108. Aviña-Zubieta JA, Choi HK, Sadatsafavi M, et al. Risk of cardiovascular mortality in patients with rheumatoid arthritis: a meta-analysis of observational studies. Arthritis Rheum. 2008;59(12):1690-1697. 109. Balbir-Gurman A, Yigla M, Nahir AM, Braun-Moscovici Y. Rheumatoid pleural effusion. Semin Arthritis Rheum. 2006;35(6):368-378. 110. Helmers R, Galvin J, Hunninghake GW. Pulmonary manifestations associated with rheumatoid arthritis. Chest. 1991;100(1):235-238. 111. Jurik AG, Davidsen D, Graudal H. Prevalence of pulmonary involvement in rheumatoid arthritis and its relationship to some characteristics of the patients: a radiological and clinical study. Scand J Rheumatol. 1982;11(4):217-224. 112. Lee H-K, Kim DS, Yoo B, et al. Histopathologic pattern and clinical features of rheumatoid arthritis-associated interstitial lung disease. Chest. 2005;127(6):2019-2027. 113. Suzuki A, Ohosone Y, Obana M, et al. Cause of death in 81 autopsied patients with rheumatoid arthritis. J Rheumatol. 1994;21(1):33-36. 114. Gabbay E, Tarala R, Will R, et al. Interstitial lung disease in recent onset rheumatoid arthritis. Am J Respir Crit Care Med. 1997;156(pt1):528-535. 115. Saag KG, Kolluri S, Koehnke RK, et al. Rheumatoid arthritis lung disease: determinants of radiographic and physiologic abnormalities. Arthritis Rheum. 1996;39(10):1711-1719. 116. Androudi S, Dastiridou A, Symeonidis C, et al. Retinal vasculitis in rheumatic diseases: an unseen burden. Clin Rheumatol. 2013;32(1):7-13. 117. Genta MS, Genta RM, Gabay C. Systemic rheumatoid vasculitis: a review. Semin Arthritis Rheum. 2006;36(2):88-98. 118. Melsom RD, Horsfall AC, Schrieber L, Charles P, Maini RN. Anti-C1q affinity isolated circulating immune complexes correlate with extra-articular rheumatoid disease. Rheumatol Int. 1986;6(5):227-231. 119. Scott DG, Bacon PA, Allen C, Elson CJ, Wallington T. IgG rheumatoid factor, complement and immune complexes in rheumatoid synovitis and vasculitis: comparative and serial studies during cytotoxic therapy. Clin Exp Immunol. 1981;43(1):54-63. 120. Guillevin L, Dorner T. Vasculitis: mechanisms involved and clinical manifestations. Arthritis Res Ther. 2007;9(Suppl 2):S9. 121. Young S. Ocular involvement in connective tissue disorders. Curr Allergy Asthma Rep. 2005;5(4):323-326. 122. Smith JR, Mackensen F, Rosenbaum JT. Therapy insight: scleritis and its relationship to systemic autoimmune disease. Nat Clin Pract Rheumatol. 2007;3(4):219-226. 123. Michels ML, Cobo LM, Caldwell DS, Rice JR, Haynes BF. Rheumatoid arthritis and sterile corneal ulceration: analysis of tissue immune effector cells and ocular epithelial antigens using monoclonal antibodies. Arthritis Rheum. 1984;27(6):606-614. 124. Fujita M, Igarashi T, Kurai T, Sakane M, Yoshino S, Takahashi H. Correlation between dry eye and rheumatoid arthritis activity. Am J Ophthalmol. 2005;140(5):808-813. 125. Foster CS, Forstot SL, Wilson LA. Mortality rate in rheumatoid arthritis patients developing necrotizing scleritis or peripheral ulcerative keratitis: effects of systemic immunosuppression. Ophthalmology. 1984;91(91):1253-1263. 126. Fox RI. Sjögren's syndrome. Lancet. 2005;366(9482):321-331. 127. Matsuo T, Kono R, Matsuo N, et al. Incidence of ocular complications in rheumatoid arthritis and the relation of keratoconjunctivitis sicca with its systemic activity. Scand J Rheumatol. 1997;26(2):113-116. 128. Schett G, Hayer S, Zwerina J, Redlich K, Smolen JS. Mechanisms of disease: the link between RANKL and arthritic bone disease. Nat Clin Pract Rheumatol. 2005;1(1):47-54. 129. Compston JE, Vedi S, Croucher PI, Garrahan NJ, O'Sullivan MM. Bone turnover in non-steroid treated rheumatoid arthritis.Ann Rheum Dis. 1994;53(3):163-166. 130. Roldan JF, Del Rincon I, Escalante A. Loss of cortical bone from the metacarpal diaphysis in patients with rheumatoid arthritis: independent effects of systemic inflammation and glucocorticoids. J Rheumatol. 2006;33(3):508-516. 131. Strand V, Kavanaugh AF. The role of interleukin-1 in bone resorption in rheumatoid arthritis. Rheumatology. 2004;43(Suppl 3):iii10-iii16. 132. Bowman SJ. Hematological manifestations of rheumatoid arthritis. Scand J Rheumatol. 2002;31(5):251-259. 133. Wilson A, Yu H-T, Goodnough LT, Nissenson AR. Prevalence and outcomes of anemia in rheumatoid arthritis: a systematic review of the literature. Am J Med. 2004;116(suppl7A):50S-57S. 134. Vreugdenhil G, Lowenberg B, Van Eijk HG, Swaak AJ. Tumor necrosis factor alpha is associated with disease activity and the degree of anemia in patients with rheumatoid arthritis. Eur J Clin Invest. 1992;22(7):488-493. 135. Jongen-Lavrencic M, Peeters HR, Wognum A, Vreugdenhil G, Breedveld FC, Swaak AJ. Elevated levels of inflammatory cytokines in bone marrow of patients with rheumatoid arthritis and anemia of chronic disease. J Rheumatol. 1997;24(8):1504-1509. 136. Cronstein BN. Interleukin-6: a key mediator of systemic and local symptoms in rheumatoid arthritis. Bull NYU Hosp Jt Dis. 2007;65(suppl1):S11-S15. 137. Farr M, Scott DL, Constable TJ, Hawker RJ, Hawkins CF, Stuart J. Thrombocytosis of active rheumatoid disease. Ann Rheum Dis. 1983;42(5):545-549. 138. Ayvaz OC, yavasoglu I, Kadikoylu G, Bozkurt G, Bolaman Z. Thrombocytosis in rheumatoid arthritis: JAK2V617F-positive essential thrombocythemia. Rheumatol Int. 2012;32(1):269-271. 139. Baecklund E, Iliadou A, Askling J, et al. Association of chronic inflammation, not its treatment, with increased lymphoma risk in rheumatoid arthritis. Arthritis Rheum. 2006;54(3):692-701. 140. Upile T, Jerjes W, Sipaul F, Singh S, Hopper C, Wright A, Sandison A. Rheumatoid nodule of the thyrohyoid membrane: a case report. J Med Case Reports. 2007;1:123. 141. Palmer DG, Hogg N, Highton J, et al. Macrophage migration and maturation within rheumatoid nodules. Arthritis Rheum. 1987;30(7):728-736. 142. Edwards JCW, Wilkinson LS, Pitsillides AA. Palisading cells of rheumatoid nodules: comparison with synovial intimal cells.Ann Rheum Dis. 1993;52(11):801-805. 143. Joaquim AF, Appenzeller S. Cervical spine involvement in rheumatoid arthritis – a systematic review. Autoimmun Rev. 2014;13(12):1195-1202. 144. Collins DN, Barnes CL, FitzRandolph RL. Cervical spine instability in rheumatoid patients having total hip or knee arthroplasty. Clin Orthop. 1991;272:127-135. 145. Agarwal AK, Peppelman WC, Kraus DR, et al. Recurrence of cervical spine instability in rheumatoid arthritis following previous fusion: can disease progression be prevented by early surgery? J Rheumatol. 1992;19(9):1364-1370. 146. Mierau M, Schoels M, Gonda G, Fuchs J, Aletaha D, Smolen JS. Assessing remission in clinical practice. Rheumatology (Oxford). 2007;46(6):975-979. 147. van Gestel AM, Prevoo ML, van 't Hof MA, van Rijswijk MH, van de Putte LB, van Riel PL. Development and validation of the European League Against Rheumatism response criteria for rheumatoid arthritis. Arthritis Rheum. 1996;39(1):34-40. 148. Janta I, Naredo E, Martínez-Estupiñán L, et al. Patient self-assessment and physician's assessment of rheumatoid arthritis activity: which is more realistic in remission status? A comparison with ultrasonography. Rheumatology (Oxford). 2013;52(12):2243-2250. 149. Lee DM, Weinblatt ME. Rheumatoid arthritis. The Lancet. 2001;358(9285):903-911. 150. Agca R, Heslinga SC, Rollesfstad S, et al. EULAR recommendations for cardiovascular disease risk management in patients with rheumatoid arthritis and other forms of inflammatory joint disorders: 2015/2016 update. Ann Rheum Dis. 2017;76(1):17-28. 151. U.S. Census Bureau. Selected Social Characteristics in the United States: 2015. Available at https://factfinder.census.gov/faces/nav/jsf/pages/index.xhtml. Last accessed April 6, 2017. 152. Karliner L, Napoles-Springer AM, Schillinger D, Bibbins-Domingo K, Pérez-Stable EJ. Identification of limited English proficient patients in clinical care. J Gen Intern Med. 2008;23(10):1555-1560. 153. Sevilla Matir J, Willis DR. Using bilingual staff members as interpreters. Fam Pract Manage. 2004;11(7):34-36. 154. Ngo-Metzger Q, Massagli MP, Clarridge BR, et al. Linguistic and cultural barriers to care: perspectives of Chinese and Vietnamese immigrants. J Gen Intern Med. 2003;18(1):44-52. 155. Flores G. Language barriers to health care in the United States. N Engl J Med. 2006;355(3):229-231. 156. Flores G. The impact of medical interpreter services on the quality of health care: a systematic review. Med Care Res Rev. 2005;62(3):255-299. 157. Karliner L, Jacobs EA, Chen AH, Mutha S. Do professional interpreters improve clinical care for patients with limited English proficiency? A systematic review of the literature. Health Serv Res. 2007;42(2):727-754. 158. Gias C. Quality of life. In: Lubkin IM, Larsen PD (eds). Chronic Illness: Impact and Interventions. 9th ed. Boston, MA: Jones and Bartlett Publishers; 2016: 149-176. 159. Larsen PD. Chronicity. In: Lubkin IM, Larsen PD (eds). Chronic Illness: Impact and Interventions. 9th ed. Boston, MA: Jones and Bartlett Publishers; 2016: 3-22. 160. Sidell NL. Adult adjustment to chronic illness: a review of the literature. Health Soc Work. 1997;22(1):5-11. 161. Livneh Hanoch, Antonak RF. Psychosocial adaptation to chronic illness and disability: a primer for counselors. J Couns Dev. 2005;83(1):12-20. 162. Rando TA. The increasing prevalence of complicated mourning: the onslaught is just beginning. Omega. 1992;26(1):43-59. 163. Olshansky S. Chronic sorrow: a response to having a mentally defective child. Soc Casework. 1962;43:190-193. 164. Roberts CS, Piper L, Denny J, Cuddeback G. A support group intervention to facilitate young adults' adjustment to cancer.Health Soc Work. 1997;22(2):133-141. 165. Foley DP. Eleven interpretations of personal suffering. J Relig Health. 1988;27(4):321-328. 166. Wolfe F, Michaud K. Predicting depression in rheumatoid arthritis: the signal importance of pain extent and fatigue, and comorbidity. Arthritis Care Res. 2009;61(5):667-673. 167. Margaretten M, Barton J, Julian L, et al. Socioeconomic determinants of disability and depression in patients with rheumatoid arthritis. Arthritis Care Res. 2011;63(2):240-246. 168. Sleath B, Chewning B, de Vellis BM, et al. Communication about depression during rheumatoid arthritis patient visits. Arthritis Care Res. 2008;59(2):186-191. 169. Sleath B, Rubin RH. Gender, ethnicity, and physician-patient communication about depression and anxiety in primary care.Patient Educ Couns. 2002;48:243-252. 170. Nicholson NR Jr. Social isolation. In: Lubkin IM, Larsen PD (eds). Chronic Illness: Impact and Interventions. 9th ed. Boston, MA: Jones and Bartlett Publishers; 2016: 101-126. 171. Patterson JM, Garwick AW. The impact of chronic illness on families: a family perspective. Ann Behav Med. 1994;16(2):131-142. 172. Boice MM. Chronic illness in adolescence. Adolescence. 1998;33(132):927-939. 173. Clark HB, Ichinose CK, Meseck-Bushey S, et al. Peer support group for adolescents with chronic illness. Child Health Care. 2002;21(4):233-238. 174. Eccleston C, Wastell S, Crombez G, Jordan A. Adolescent social development and chronic pain. Eur J Pain. 2008;12(6):765-774. 175. Larsen PD. Impact of Chronic Illness on the Patient and Family. In: Lubkin IM, Larsen PD (eds). Chronic Illness: Impact and Interventions. 9th ed. Boston, MA: Jones and Bartlett Publishers; 2016: 22-31. 176. Erikson EH. Reflections on Dr. Borg's life cycle. In: Erikson EH (ed). Adulthood. New York, NY: Norton; 1978: 1-31. 1. Jacobson JA, Roberts CC, Bencardino JT, et al. ACR Appropriateness Criteria: Chronic Extremity Joint Pain, Suspected Inflammatory Arthritis. Reston, VA: American College of Radiology; 2016. Summary retrieved from National Guideline Clearinghouse at https://guidelines.gov/summaries/summary/50494. Last accessed April 12, 2017. 2. Medical Services Commission. Rheumatoid Arthritis: Diagnosis, Management and Monitoring. Victoria: British Columbia Medical Services Commission; 2012. Summary retrieved from National Guideline Clearinghouse at https://guidelines.gov/summaries/summary/39244. Last accessed April 12, 2017. 3. National Institute for Health and Clinical Excellence. Tocilizumab for the Treatment of Rheumatoid Arthritis. London: National Institute for Health and Clinical Excellence; 2012. Summary retrieved from National Guideline Clearinghouse at https://guidelines.gov/summaries/summary/36890. Last accessed April 12, 2017.